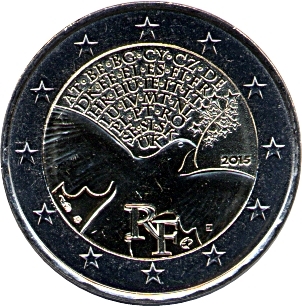 In the coin’s central field is a modern graphic representation of a dove. It is carrying an olive branch, the symbol of peace, whose branches have been replaced by the 12 stars of the European flag. The 28 countries of the European Union are represented by the ISO code for each country. 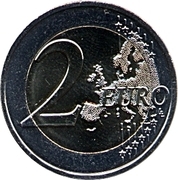 The letters RF (République Française) are at the bottom of the coin. 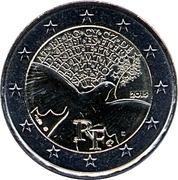 The mint marks are on the left-hand side and the year 2015 on the right. The coin’s outer ring bears the 12 stars of the European Union.